Right now I am in the process of turning Peyton’s toddler themed room into a big girls room. Currently, we have Sofia the First wall stickers on the walls and lots of toddler size furniture. I want to give her a more big kid theme room without making her grow up too fast. One way I am going to do this is by adding touches of her favorite characters to the room. Things that can easily be taken down when she gets older or that can grow with her. 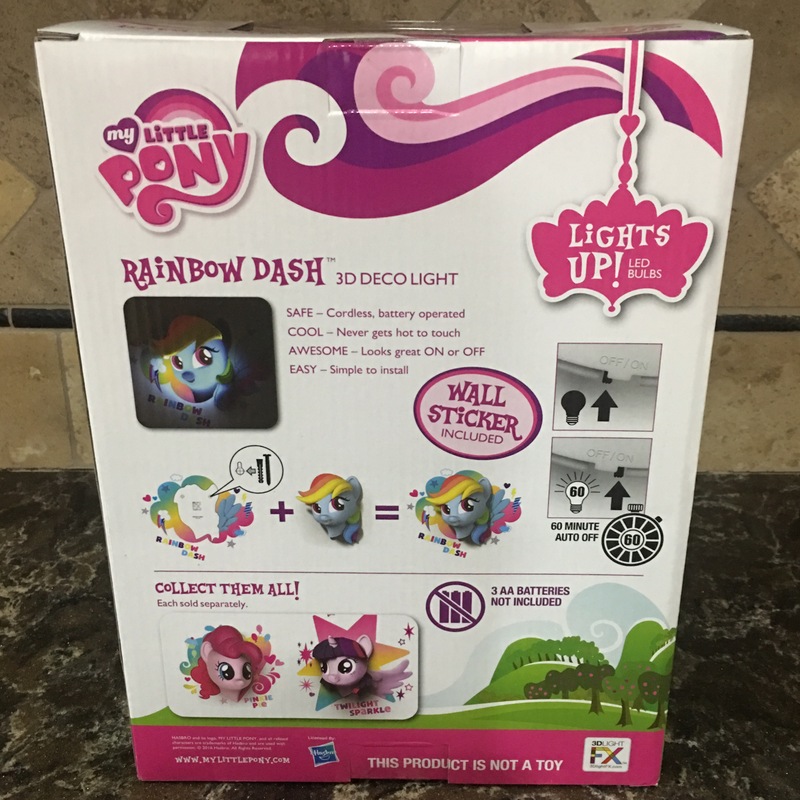 This Rainbow Dash wall sticker/night light is one of my new additions to her room. Peyton is only 6-years-old and she’s not fond of sleeping in complete darkness. But she also doesn’t want a little kids nightlight in her room. But she will let Rainbow Dash hang out with her in her new room. It’s a bonus that Rainbow Dash lights up and can help illuminate the room at bedtime. Rainbow Dash is really simple to install. Like insanely easy. It’s one screw into the wall and then you just hang up Rainbow Dash similar to how you would hang up a clock. 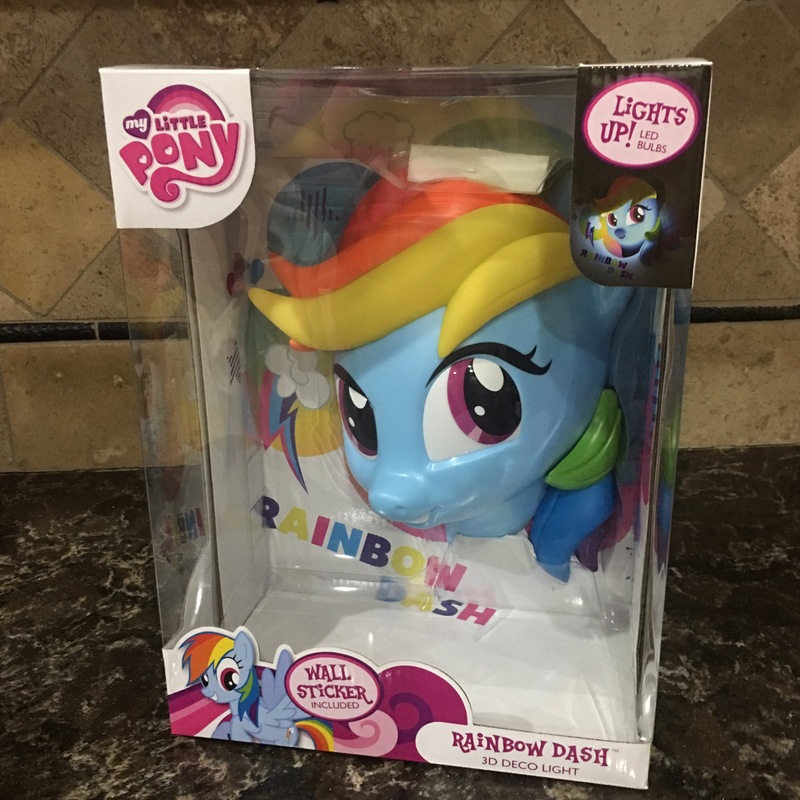 You will need 3 AA batteries to power Rainbow Dash. And it uses LED lightbulbs. And it does not get hot! No matter how long you have your light on it won’t get hot. I love this! 3DLIGHTFX 3D Deco Lights are the perfect gift this holiday season. They have a full range of comic book, super hero, Disney Princess, sports and car lights that look as though they are popping right out of the wall! They are battery operated and cool to the touch so you can place them anywhere in the room! These can be used as a room decoration or a nightlight. I love when items have dual purposes. Besides Rainbow Dash there is also Twilight Sparkle and Pinkie Pie. You can create a little collage of My Little Ponies! If My Little Pony is not your little one’s thing 3DLIGHTFX makes dozens of other designs. They are available at Target so next time you are in the store check them out.